Car number 1-50 below, 51-100, 101-150, 151-208. 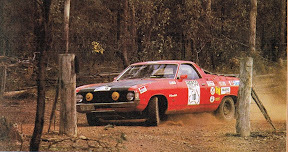 Despite starting first on the road (allocated because Herrmann won the previous Ampol Round Australia Rally in 1970), a poor run on the seeding stage (26th) saw Herrmann and Rainsford drop down to about 18th on the road and this was to cost them dearly at the Bordertown bog where they lost 46 minutes. They placed 25th into Adelaide. They climbed to 18th by Coober Pedy but lost over 2 hours enroute to Immarna. After a careful run across the Nullarbor they placed 19th into Perth. A reasonably trouble free run through WA saw them 13th into Darwin and then up to 10th by Townsville. They were locked in battle with their team mates in the other Porsche and the Loader/Hill/Neale Lancer all the way down the east coast and eventually placed 8th outright close behind the Lancer. They were the leading two-man crew. After placing 5th on the seeding stage, the Cowan Citroen went well until the sand of the Sunset Country where the front-wheel drive did not cope, losing 22 minutes and placing 16th into Adelaide. 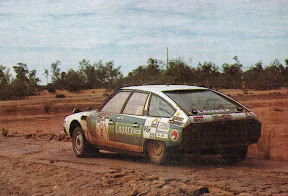 They had climed to 9th by Coober Pedy but the sand to Immarna again delayed the Citroen, but a reasonable run across the Nullarbor saw them placed 7th at Perth. A strong run through WA saw them rise to 3rd by Wittenoom before a hydraulics failure cost them time into Port Hedland where they were placed 4th, which they held into Darwin. A failed drive shaft on the first trial stage after Darwin brought their good run to an untimely end. This highly rated international crew always reckoned they were too careful early on, evenually finishing 3rd. They were 6th into Adelaide but had dropped to 9th by Perth after some minor mechanical gremlins and a generally cautious approach. They clearly won the division to Darwin where they were placed 3rd. Despite placing 2nd on each of the remaining three divisions, the conditions and easy target times didn't allow them to gain enough time on their team mates to change their overall position. 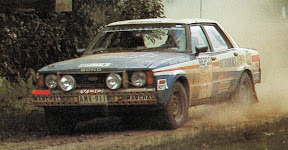 After a nervous start with a puncture on the seeding stage, the Bond Cortina was 4th into Adelaide. They set a blistering pace on the next division and lead the event into Perth despite mechanical dramas with the front end and engine mounts. It all went wrong soon after Perth with an unfortunate roll on a transport stage and then a bent sump on the next trial stage. They limped into Geraldton in 5th but would need time for repairs. 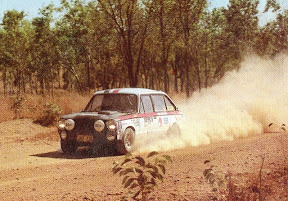 After that they began to haemorrhage time as the engine kept losing oil and they eventually retired at Wittenoom while in 8th after trying to complete the Nunyerry Horror Stage. The eventual winners of the event were 2nd into Adelaide, but punctures dropped them to 3rd into Perth. 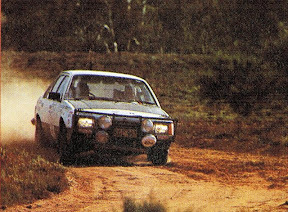 They took the lead from their team mates (Ferguson/Bell/Body) on the stages into Port Hedland but then almost lost the lead on the stage after Port Hedland with a broken tie-rod. They relinquished the lead on the stage after Mount Isa but regained it on the horror stage before Rockhampton when their team mates wrong slotted. 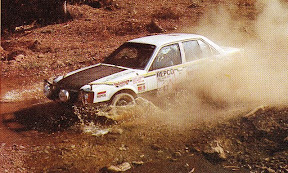 After that they were never headed despite a minor off on the Collombatti Special Stage before Port Macquarie. After a poor run on the seeding stage (27th), the front wheel drive Audi struggled in the sand of the Sunset Country dropping 21 minutes and placing 17th into Adelaide. They climbed as high as 14th before once again losing time in the sand enroute to Immarna, and then were delayed by punctures on the Nullarbor. 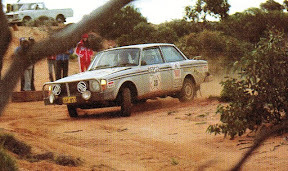 The Audi's suspension broke on the Narrogin Special Stage and they limped into Perth in 26th place, last of those who had visited all controls. After Perth it became a case of trying to deal with a car that was falling apart and after Geraldton they started missing controls in a bid to keep inside the late time limit, but they did not make it to Darwin in time to continue. Experienced and hard charging Dunkerton was teamed with journalist Peter McKay and last minute conscript, Geoff Jones, after Col Young withdrew. 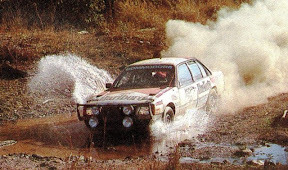 Their Volvo suffered a series of mechanical failures througthout the event yet the determined Dunkerton brought the car home in an amazing 4th place. After a slow start (19th on the seeding stage) they were 12th at Adelaide. They lost time at Marree and enroute to Immarma, dropping them to 14th, but some inspired driving nearing Perth raised then to 11th. A great run through WA saw them rise to 5th by Port Hedland, but a failed fuel pump cost time on the Gibb River Road dropping them to 6th at Darwin. Despite a broken rear suspension near Mount Isa, they held 4th into Townsville. They withstood a determined charged from Carr to hold onto 4th through to the finish. 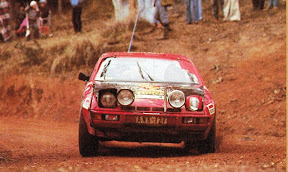 The Barth/Kushmaul Porsche started cautiously (17th on the seeding stage), but dropped time near Tarpeena before reaching Adelaide in 19th. A cracked fuel line cost them time before Broken Hill but they climbed to 16th by Immarna. They then lost time on the Nullarbor like so many others, placing 16th into Perth. A good run through WA saw them climb to 10th by Darwin. The good run continued through NT and Qld with them placing 7th at Townsville. They held this until a roll near Bellingen which dropped them to 9th which they held through to the finish. 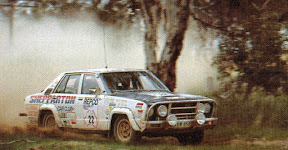 Reigning Australian Rally Champion, Greg Carr, was always fast and was within seconds of Portman during the first night. A loose distrubutor and broken shock absorber delayed them near Muuray Bridge and they placed 10th into Adelaide. Carr set a cracking pace on the division to Perth but front suspension problems emerged near Kalgoorlie costing valuable time. They placed 4th at Perth but time lost repairing the car saw them drop to 8th at Geraldton. Being down the field, they battled dust all through WA to eventually place 5th into Darwin, a truly remarkable effort. Further problems besieged the Cortina crew near Borroloola and then they lost more than an hour carrying out repairs at Mount Isa dropping to 7th. They were 6th into Townsville after Portman was also delayed. 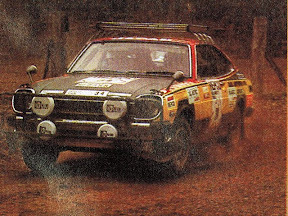 Carr was the fastest down the east coast and easily overhauled the Nalder Celica by Sydney, bringing some pride to the battered Ford team with their 5th placing. 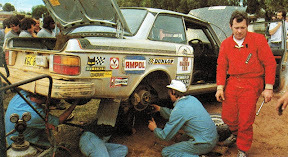 Experienced American driver, Henrik Blok, was to have driven a Porsche but difficulties lead to a Falcon ute being prepared at the last minute. Sadly, Blok and Thompson had the dubious honour of being the first retirement from the event after breaking an axle on the seeding stage. The only diesel vehicle in the event proved to be super reliable, albeit a bit slow. Despite being a two-man crew, Watson and Harrowfield had plenty of experience and had a largely incident free event, only hampered by being slow and running a bit down the field on occasions. After placing 34th on the seeding stage they lost almost an hour in the Bordertown bog and placed 29th into Adelaide. From there they climbed to 18th by Perth, 14th by Darwin and 12th at Townsville. They were officially classified as finishing 11th outright after Portman's dramas although a careful look at the scoring suggests that perhaps they should have been classified 10th. 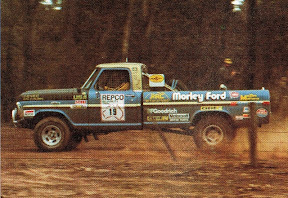 Mizel and Hall were experienced American off-roaders but they had perhaps never seen anything like the Repco. While the vehicle was tough, it was certainly not quick and did encounter a variety of problems. After placing 30th on the seeding stage, they reportedly ran out of fuel near Bordertown losing 2 hours and placing 42nd into Adelaide. By Perth they were up to 24th, 17th by Darwin and 13th at Townsville. 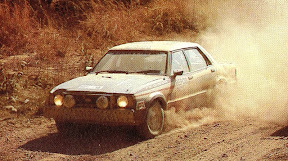 Experinced navigator, Adrian Mortimer, managed late time carefully throughout the event so that they visited all controls and were classified 12th outright. A wealth of experience in this crew was thwarted by the unreliability of the Cortina. Fury placed 10th on the seeding stage and after losing a small amount of time at the Bordertown bog, they placed 14th into Adelaide. 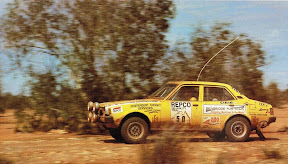 The car needed work leaving Adelaide and they dropped places, recovering to 11th by Coober Pedy. A good run across the Nullarbor placed them 5th at Perth. After Perth the suspension and engine mount problems dropped them down the field as they tried to effect repairs at Geraldton and later at Newman. They eventually cut and ran from Wittenoom to Darwin, dropping 9 controls. Despite running down the field, they had a reasonable run after Darwin placing 12th on the division to Townsville, and were going well until they struck more problems after Grafton, losing 2 hours. They placed 11th on the final division and were officially classified as finishing 25th outright. After being 87th on the seeding stage, the Subaru took their rightful place further down the field, placing 59th into Adelaide. A consistent effort saw them rise to 43rd by Immarna and despite missing 3 controls on the Nullarbor they were placed about 34th at Perth. They struck trouble after Perth and cut 10 controls to near Port Hedland after which they caused some havoc in front of Cowan and Nalder on the Gibb River Road. They missed another 5 controls to Townsville, but placed 13th on the division to Sydney. They skipped most of the final division but were classified as finishing 44th. The back up car in the privately entered Audi team seemed to strike problems from the outset and eventually placed 56th into Adelaide. Things went from bad to worse after leaving Adelaide when the Audi hit a kangaroo enroute to Broken Hill and retired with terminal engine problems. 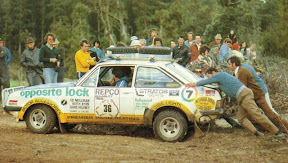 The Ferguson/Bell/Boddy Commodore was always near the top after placing 9th on the seeding stage. They had a problem free run to Adelaide where they were 3rd. They took the lead into the Nullarbor Roadhouse but then relinquished it to Bond on the Rawlinna stage, reaching Perth in 2nd place. 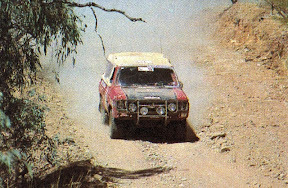 After Bond's demise they took the lead after Perth until they became bogged in sand on both the Nunyerry Horror Stage and the Mundabullungara Stage, losing 45 minutes on Brock. After Brock broke a tie-rod after Port Hedland, Ferguson/Bell/Boddy trailed Brock by just 3 minutes at Darwin. They overtook them on the stage after Mount Isa and lead the trial into Townsville. 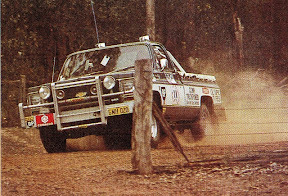 A problem on the horror stage north of Rockhampton saw them relinquish the lead to Brock, which they would never regain, thus finishing 2nd outright. This experienced American desert racing entry set a few impressive times throughout the trial but encountered many problems. They missed 9 controls before Adelaide, a further 15 enroute to Perth, only 3 more on the division to Darwin, 13 missed to Townsville, 3 missed controls to Sydney and a further 12 missed on the final division for a total of 55 controls missed. They were classified as finishing in 69th place. 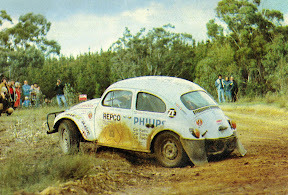 Adventurer, Hans Tholstrup, started badly hitting a stump and cracking the differential on the seeding stage. They subsequently missed the 6 controls to Mount Gambier, but continued without further controls missed to Adelaide. They continued to encounter major challenges for the remainder of the event. They missed a further 8 controls to Perth and then missed most of the division to Darwin after snapping a wishbone, but made it within the late time limit to stay in the event. With continuing problems, including a cracked front crossmember, they missed 14 more controls to Townsville, 6 missed to Sydney and a further 5 missed on the final division, they missed a total of 56 controls but were classified as finishing 67th. 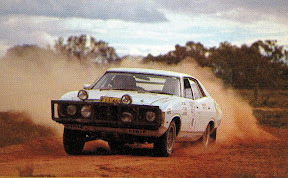 They did however help a lot of other competitors throughout the event, including pulling folks through the Bordertown bog and giving the stranded Bond Cortina a tow up in NT. Fast charging Portman was the story of the Repco for the first week. They were fastest on the seeding stage and lead the event into Adelaide, maintaining that lead until they hit the Nullarbor. A series of punctures resulted in them driving on the rims and scrounging tyres, losing 2 hours and dropping to 8th into Perth. More disaster truck after Perth with a pre-dawn roll at Wanneroo, costing them more than an hour and several places. By Darwin they had climbed back up to 7th. A broken rear axle housing into Burketown and more problems at Cairns dropped them to 8th at Townsville. A quick run down the east coast ended badly with a roll on the final stage before Port Macquarie. Although they were technically 7th at Sydney, the Stanza was so badly damaged that they had to skip much of the final division, eventually missing 7 controls and being placed 22nd. 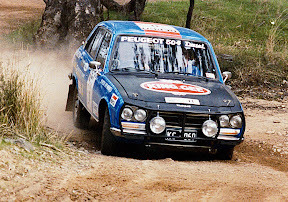 Experienced former Victorian Rally Champion, Gil Davis, prepared and drove this 180B. They were often quick but encountered many dramas. They started slowly and placed 28th into Adelaide after time lost at the Bordertown bog. By Perth they had climbed to 15th and were 11th or 12th by Darwin. They basically stayed in that position all the way to the finish, but a broken axle on the last night almost saw them retire. They were lucky that a following car had a spare axle and they were able to continue, officially finishing 10th outright. 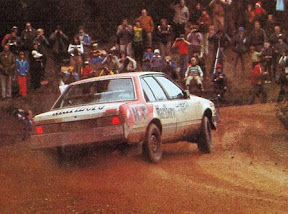 The highly experienced Stewart was always quick in this privately entered Commodore. After placing 16th on the seeding stage, they placed 11th into Adelaide. Despite some problems in the Flinders Ranges, they climbed to 7th by Immarna but then struck punctures on the Nullarbor like many others. Fatigue was also a factor for the two-man crew and they dropped to 17th into Perth. They stuggled on some of the the horror stages in WA but would have been in about 14th or 15th at Port Hedland, despite being totally exhausted. When the clutch failed after Port Hedland they were forced to retire. Jensen was Managing Director of Volvo Australia and was the instigator of the 6 strong Volvo team. Johnson was a very experienced navigator. However Jensen was always well off the pace, being 31st quickest on the seeding stage but climbing to 14th outright into Adelaide. They slipped to 20th before the Nullarbor where they had punctures and lost so much time that they were forced to skip the Rawlinna stage, dropping 2 controls. They did not drop any more controls, placing 22nd on the division to Darwin and 20th on the division to Townsville. Their run down the east coast came to an unfortunate end when they rolled on Horseshoe Forest Road near Bellingen and were forced to retire. 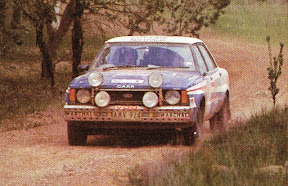 This all Canadian crew had plenty of experience in long distance events but perhaps less so in intense rallying. 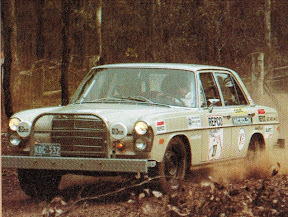 The only Mercedes in the event was generally slow and by Adelaide they were in 75th place. They struck problems in the Flinders Ranges, dropping a control, then skipped from Marree to Nullarbor Roadhouse, also skipping the Rawlinna stage so dropping 7 controls by Perth. After a valve guide disintegrated north of Perth they ran the remainder of the vent on 5 cyclinder. On the WA division they cleverly skipped 3 trial stages but only dropped 2 more controls to Darwin. They missed much of the division to Townsville, dropping 11 controls, then missed the first 2 controls out of Townsville. They completed the remainder of division to Sydney but then skipped most of the final division, missing a total of 34 controls and being classified 47th outright. The famous Gelignite Jack was winner of the 1954 Reddiex Trial without any time lost. 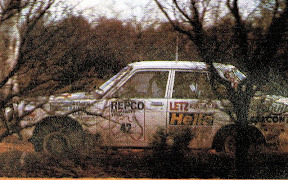 How different the Repco was from that early Round Australia! Nonetheless, this crew had a solid start placing 42nd on the seeding stage and 46th into Adelaide after losing close to 2 hours in the Bordertown bog. They lost 40 minutes effecting repairs in Broken Hill but had climbed to 40th by Coober Pedy. Like so many, they lost time on the Nullarbor, skipping the Rawlinna stage and 2 controls. They had an arduous run through WA but missed no more controls before Darwin. After Darwin they skipped directly to Borroloola, missing 3 more controls. They were struck by problems down the east coast and skipped 6 more controls before Sydney but completed the final division in 28th. They dropped a total of 11 controls and were placed 29th outright. Bryson, an experienced navigator, took his bride-to-be on the Repco, marrying her in Broken Hill and then doing a lap of Australia as a honeymoon! They did very little actual competition, missing a total of 104 controls. They should have perhaps dispensed with the well prepapred rally car and taken a rental car! 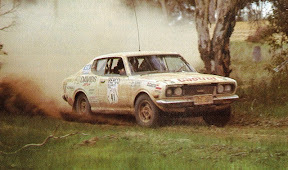 The experienced Lloyd drove the 'stretched' Colt often quickly, but started badly placing 76th on the seeding stage, then climbing to 44th by Adelaide. They climbed to 34th by Coober Pedy but they didn't make it through the Nullarbor unscathed, dropping 7 controls. After Perth they damaged the Colt's steering on the Rabbit Run stage then ended up dropping a further 5 controls in the Hammersley Ranges. They had a reasonable run after Darwin but dropped the last stage into Townsville. They placed 24th on the division to Sydney and 35th on the final division, placing 31st outright overall with 13 controls missed. 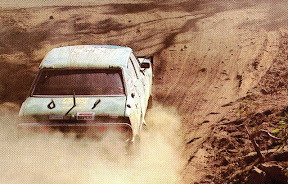 Experienced racing driver, Larry Perkins, with brother Gary, started cautiously placing only 36th on the seeding stage but came into their own once they hit the sand of the Sunset Country. They placed 7th into Adelaide and then set a cracking pace through to Broken Hill where they had climbed to 6th. However, their cracking pace brought them undone when they rolled the VW on the twisty road through the Angorichina Gorge just before Blinman. They apparently rejoined the event unofficially at Darwin and did a number of stages with Colin Bond's car number on the side! This Japanese crew started cautiously, placing 64th on the seeding stage. This dropped them well down the field and they then lost 2 hours in the Bordertown bog, after which they skipped to Kuitpo, dropping 6 controls. They left Adelaide late, dropped 2 hours on the first trial stage and then skipped directly from Yunta to the Nullarbor Roadhouse. After doing just one trial stage on the Nullarbor they skipped to near Narrogin, missing a total of 15 controls on the division. They retired at Perth. Both former SA rally champions, this crew had plenty of experience. They started slowly, placing 49th on the seeding stage and placed 50th into Adelaide after losing more than an hour in the Bordertown bog and almost an hour in the Sunset Country. After climbing up to 41st, they struck problems on the Nullarbor, exceeded late time and skipped directly to Perth dropping 12 controls. Problems after Perth saw them cut from Geraldton to Port Hedland dropping 10 more controls. They nevertheless did a quick time on the Kimberley stage. They missed a further 7 controls into Townsville, and another 10 into Sydney including missing most of the Brisbane to Sydney run. They completed the entire final division placing 32nd. They missed a total of 39 controls and were classified as finishing 59th outright. This was an experienced crew headed by the the flamboyant Ed Mulligan. After placing 12th on the seeding stage, they encountered car trouble at Mt Gambier, losing almost 2 hours, then being down the field, they lost an hour in the Bordertown bog so they had dropped to 56th at Renmark. 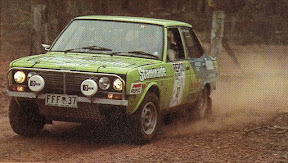 They then had terminal problems on the Kuitpo special stage, dropping the control and limping in Adelaide where they retired. One of several all-female crews in the event. The crew was originally intended to include experienced English driver, Jean Denton, but she withdrew due to illness. Placing 84th on the seeding stage put them well down the field, resulting in them being stuck for many hours in the Borertown bog, after which they skipped to Adelaide, missing 9 controls. Enroute to Perth they basically skipped all the Nullarbor stages but picked up quite a few controls along the way, dropping 10 controls to Perth. On the WA division they skipped much of the competition but cleverly picked up most of the controls, only missing 3 more enroute to Darwin. After Darwin they basically skipped directly to Mt Isa, and skipped several more stages after that, dropping 8 more controls by Townsville. Similarly, they skipped directly to Rockhampton but did much of the route to Sydney, and most of the final division. They missed a total of 38 controls but were classfiedi as finishing 60th outright. Johnson placed 18th on the seeding stage and climbed to 9th by Adelaide. Their performance on the division to Perth was impressive, and despite fatigue being a factor by Kalgoorlie, they placed 6th at Perth. After the demise of the Fords, this two-man crew held an amazing 3rd place at Geraldton but their great run came to an unfortunate end with a siezed diff north of Meekatharra. They got it going again and perservered, dropping 8 controls before Darwin. Problems after Darwin saw them miss much of the competition to Mt Isa, dropping a further 4 controls. They completed the remainder of the course to Melbourne, but not without some dramas, placing 19th on the division to Sydney and 12th on the final division. They were classified as finishing 30th outright with 12 controls missed. 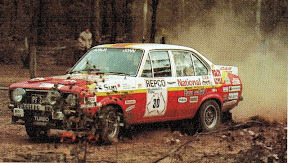 The experienced and hard charging Hodgson had some early problems with the Falcon, being only 39th on the seeding stage and losing valuable road position. They climbed to 20th by Adelaide after Mitchell cleverly bypassed the Bordertown bog. They had a good run through the Flinders Ranges and had climbed several places before they struck punctures on the Nullarbor. Rear suspension problems combined with punctures to force them to retire on the Rawlinna stage. Hard charging Revs Rowney placed 6th on the seeding stage but slowed on the remainder of the division, placing 9th into Adelaide. Problems on the overnight run from Broken Hill to Coober Pedy dropped them a few placed but a reasonable run across the Nullarbor saw them 10th at Perth. They were late leaving Perth and lost more time with problems at Geraldton, and were down to 13th by Wittenoom after battling dust down the field. A fantastic run through Nunyerry saw them climb back to 8th by Port Hedland which they held all the way to Darwin. 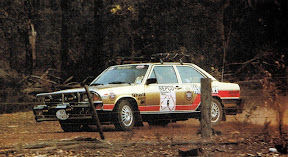 However they had a burnt valve before Darwin but were unable to find a replacement so ran on 3 cyclinders all the way to Townsville, losing 2 hours at Katherine and more time on the dusty stage to Burketown, dropping them to 13th at Mt Isa. A further hour lost at Croydon brought them close to their late time limit at Cairns forcing them to cut to Townsville and miss a single control. The problems continued down the east coast with them placing 31st on the division to Sydney, but 7th on the final division. They were classified as finishing 15th with 1 control missed. 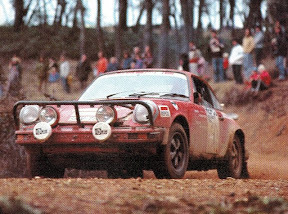 All former state champions, this was an experienced crew in perhaps the most common rally car of the day, the Datsun 1600. They were quick from the outset, 7th on the seeding stage and 5th into Adelaide. 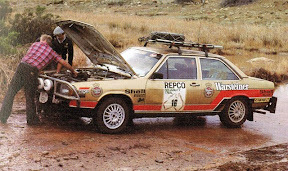 Their good run continued well into SA, but they struck multiple punctures on the Nullabor then broke the engine when they hit a spoon drain too quickly on the trial stage before Kalgoorlie. 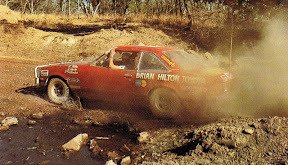 The experienced Brian Hilton chose to take a relatively inexperienced crew and consequently carried much of the driving responsibilities himself. They were 26th on the seeding stage and after losing time at Bordertown they reached Adelaide in 21st place. They had an off in the Flinders Ranges dropping several places, but had a reasonable run across the Nullarbor to reclaim 21st place at Perth. They set some very quick times in WA, particularly through the Hammersley Ranges, and climbed to 15th by Wittenoom, but damage to the suspension cost them service time in Port Hedland. They reached Darwin in 16th. They encountered a sequence of problems after Darwin, losing lots of time at Katherine, Borroloola and into Burketown, falling to the last of those who had not missed a control. They hung on tenaciously completing the division into Townsville just inside their late limit. They departed Townsville late, then hit a ditch and lost a wheel and brake drum south of Sarina losing a lot of time. They stopped to help at the Parsons rollover and were out of late time as well as out of energy, and so retired before Brisbane. 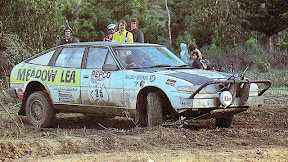 Corr was the 1979 WA rally champion but the only Saab in the event was pretty standard. They were 57th on the seeding stage and being down the field, they lost 2 hours in the Bordertown bog and an hour in the Sunset Country to place 61st into Adelaide. They had climed to 47th by the time they reached the Nullarbor but punctures meant they did not reach the Nullarbor Roadhouse within their late time and they skipped to Perth dropping 12 controls. They then retired with gearbox problems at Geraldton, soon after Perth. This was an experienced privateer entry with some MHDT support. They started slowly, 33rd on the seeding stage and then lost time on most of the first night stages, placing 30th into Adelaide. They had a careful run through SA and the Nullarbor to be 22nd by Perth. They lost some time leaving Perth late, and more at Geraldton and Newman, but managed to hold 18th at Port Hedland and climb to 15th by Darwin. Despite some problems, they were 14th at Mt Isa but then had to change the engine, costing them 5 hours. They just managed to make it to Townsville inside their late time limit and were to be the last of the cars to have not missed a control. They had a troubled run down the east coast, placing 30th on the division to Sydney, but 14th on the final division. Crucially, they did not miss a control and were placed 13th outright. 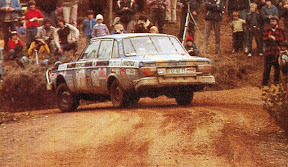 The experienced Ian Hill headed this team in the Lancer, one of the most successful rally cars of the 1970s. They started slowly, 43rd on the seeding stage. Despite losing 45 minutes at Bordertown, they placed 22nd into Adelaide. Their good run in SA was interrupted by an accident with another vehicle enroute to Immarna, but they had climbed to 19th. A careful run across the Nullabor saw them in 14th at Perth. A good run through WA saw them up to 10th at Port Hedland, but a slipping clutch after being stuck in the sand slowed them, and required changing at Sandfire. They were 12th into Darwin, but a clean run after Darwin saw them 9th at Townsville and up to 8th by Sydney as a result of Barth's roll. Despite a close tussle with Herrmann on the final division, they held on, finishing 7th outright after Portman's demise. I was the owner and prepared car 7,the Volvo 244DL and entered it on behalf of the Qld Volvo Dealers who contributed $4000 of the $160,000 I spent on the event.The engine and some other components were done by Ron Richards of Brisbane Engine Centre.I was asked to enter the car by Qld State Manager of Volvo,John Carvel as I was the newest and youngest Volvo dealer in Australia(28years).I had 3 months to prepare the car.I was recently in contact with Ross Dunkerton in Cairns and keep in contact with Peter and Ron,Ron having gone around Aust in one of my 2 service cars for the Trial.I am currently organising a 40th Anniversary get together with the group for 2019,I also still have the cast bronze trophy for 4th and Ist in class as well as first 4 cylinder home.It was an amazing race and the stories are legendary,I regard myself as very fortunate to have been involved in such a one and only event!Peter McKay also joined me in another one and only,the 1994 Cannonball Run.